Although Lollapalooza has been around for 20+ years now and has expanded into other countries like Brazil, Chile and (2013) Israel, this was the first year we made it to the three-day festival in Chicago. And since it was our first time there, we wanted to make sure we could plan our day well - get around Grant Park quickly, quickly find our favorite bands, the food, beer, bathrooms. We used the festival's official iPhone app which provided many features while keeping the experience simple. Overall, navigation worked well, most features exceeded expectations and the workflow of creating a schedule (albeit short) was great. However, explanation of the Group Text feature and phone coverage (which wasn't the app's fault but still had a major impact on the user experience) must be improved. 1. Lineup tab and ability to add artists to our schedule - I could easily see who was playing when, select the artist, get information about their music and click the star by their name to add them to the schedule. This feature was very useful and usable. 2. Map - the interactive map showed the location of every stage, bar, restroom and Camelbak water station. It also provided a 'drop pin' feature so you could quickly share your location with friends. 3. 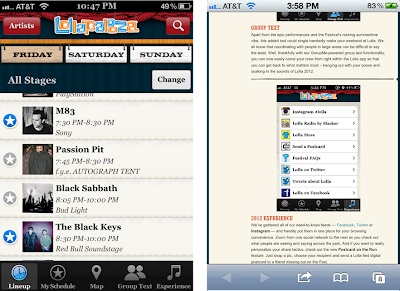 Integration with third-party apps - Instagram photo sharing was a great way to experience the festival with others and Slacker radio within the Lolla app was a convenient and fun way to to decide which unknown bands I wanted to see. 4. Experience tab - because of the Festival FAQs accessible from the app, I really didn't have a reason to go back to the Lolla website at all (after purchasing tickets, which I couldn't do using the mobile app). I understood what (and what not) to bring and information about food vendors, beverages and safety. 1. Group text - although the process started off fairly well (beginning with a bright, 'start a group' button), I missed the What is Group Me link at the beginning of the flow which explained the value of the feature and why, most importantly, our group would be assigned a phone number (for texting) with an '862' area code. My friends asked 'what is this text from group me? It's a 862 area code.' This was very confusing. Since the number was unfamiliar and our group didn't expect the strange area code, our excitement faded and our trust in the feature was gone. We simply ended up relying on our own phones' group text feature. The apps needs to explain the Group text feature better and make the explanation more visible. 2. ATT's coverage - I know. You're thinking 'there are 90,000 people in Grant Park all trying to access the same service and you're surprised you can't get coverage?. But really, what's the point of the app if it can't work while you're at the festival? If there were any schedule updates or emergency notifications (like on Saturday during the rain storm), I wouldn't have known about them. This was my first trip to Lolla and I was really impressed with the app. We were able to watch M83, Black Sabbath, the Shins, the Black Keys (all for the first time) and others on Friday and planned the whole day by using it. It really helped us get prepared and I expect that some of the negative aspects will be addressed before next year.